Two decades into his work in the kitchen and bath industry, Joel Warners, owner of Faucets N’ Fixtures in Orange, California, tells us how he stumbled into his dream job, how his company rose above the recession, and how Native Trails products have played a role in crafting some of his most memorable kitchen and bath designs to date. NT: Tell us about your history in the kitchen and bath industry. JW: I started working at Faucets N’ Fixtures about 21 years ago. I’ve known the original owner since I was five years old, and when I got a bit older, he gave me a part-time job during summers and weekends. I later moved to Michigan for college, where I studied architecture and business. After I graduated, I knew that I wanted to return to California, so I contacted him again and he gave me my old job back. It was a great “temporary gig”—I loved helping customers dream up their perfect kitchens and bathrooms. However, at that time, I thought this company was just a job, not my career—boy, did I get that wrong. Seven years ago the previous owner’s daughter, Rhonda, and I partnered together and bought the company. NT: How has the industry evolved since you took over ownership? JW: When Rhonda and I bought the company, business was on a huge upswing, and stores like ours were flourishing. But when the economy fell apart, we, like everyone else in the design/build industry, were terrified. It was hard because many of our competitors opted to focus on price. Faucets N’ Fixtures survived by staying true to our roots of quality and authenticity, and continuing to invest in innovation. In the end, those competitors got weeded out; our business is once again flourishing because there are fewer of us focusing on high-level projects. It is for that same reason that we have such a great working relationship with your company; you can’t get more authentic than Native Trails. NT: Which of our sinks do you favor? JW: I really love the new NativeStone® Collection. That 48” cement and jute trough sink is really fantastic. In the past, I would’ve had to get something similar custom made. Not now. This new material is lighter, less-porous, environmentally friendly, and that revolutionary sealer protects the surface—all things that regular concrete sinks are not. NT: What Native Trails bathroom vanities do you sell most frequently? JW: We have sold many of your 36” Chardonnay vanities. Orange County is big on wine, and our customers like that you repurpose oak wine staves that were actually used to make wine. This furniture offers a story, one that they can and will tell their friends over and over, and that is good for everybody. These designs put a spin on “rustic” by adding up-to-date, cleaner lines. Your Bordeaux Wall Mount vanity is extremely versatile; it works in the lavatory, and it would be a very cool piece in a wine cellar, too. Southern California is so fast-paced that we tend to savor those moments of quiet, relaxing over a glass of wine. NT: What was one of your favorite projects using Native Trails products? JW: A few years back, we had a couple come to the showroom with a grand design plan of merging “modern meets organic,” using their surrounding natural environment as the motivation. The main feature of focus in their master bathroom was going to be a freestanding tub, so of course I showed them your Native Trails bathtub collection. 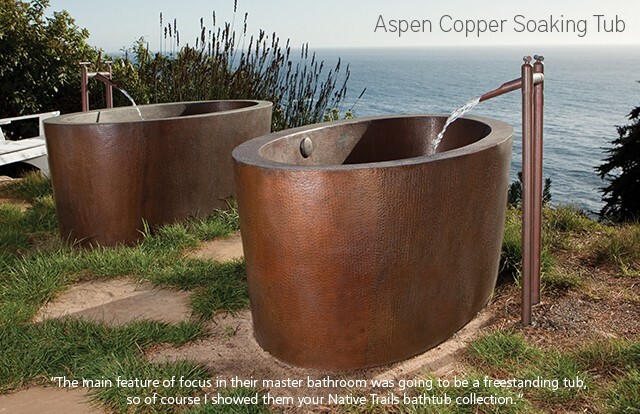 They both had an immediate response to your handmade copper Aspen tub, as it was exactly what was in their dreams. NT: What do you love most about what you do? JW: I love to help my customers create beautiful and lasting spaces. I especially love taking on projects where the client has no idea what they want when they walk into our showroom and together, starting from that blank canvas, we create a kitchen and/or bathroom that exceeds all of their expectations. Even when customers come in with a set of architectural plans, they still are looking for guidance from us, because we’re so immersed in this ever-changing industry, whereas an architect wouldn’t have the intimate knowledge of product lines like we do. I also love the business management side – as I mentioned previously, investing in innovation was a key strategy in helping us through the recession. We’ve created a state-of-the-art, interactive showroom, The Gallery. This advanced technology allows our clients to truly participate in the design and selection experience. The Gallery is filled with innovative products and designs for the kitchen and bathroom, so our clients get to see them come to life like they would in their own homes. NT: Your enthusiasm for what you do reminds me a little of another Orange County visionary; I think Walt Disney would have liked to visit your showroom – perhaps specifically The Gallery.